We are completely equiped with all necessary special tools for repairs and maintanence of regulators, BCD's and cylinders. 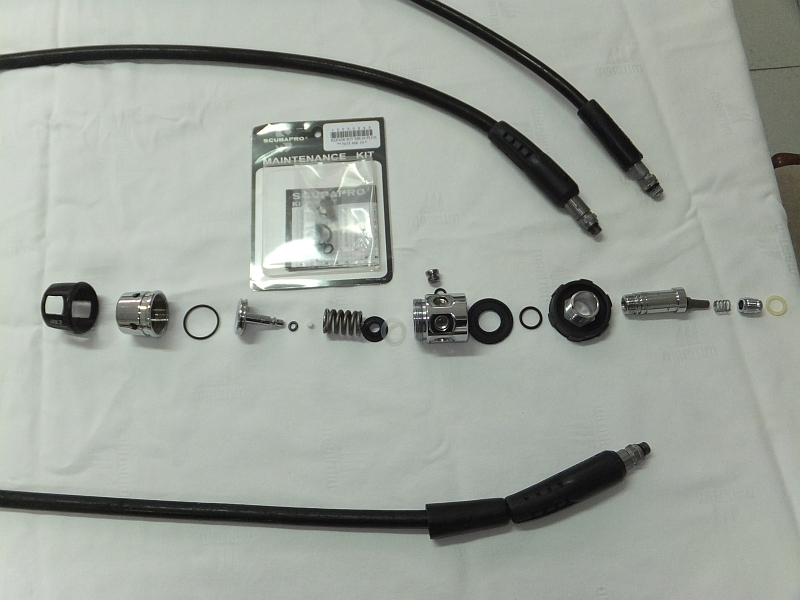 For any technical service we use exclusively ORIGINAL REPAIR KITS of the manufacturer. We are licenced service technitions. We participate frequently in technical seminars of the manufacturers. Private regulators should be serviced once a year. Our rental regulators are being serviced in intervals of 6 months. All regulators will be disassambled completely and cleaned in acid baths and in ultra sonic cleaners. All replacement parts will be replaced by original repair parts of the manufacturer. Then the regulator will be assambled and adjusted. NEVER try to manipulate or repair a regulator on your own! It takes a special training, many expensive special tools and a lot of experiance to disassamble and reconfigure a regulator properly. Any try to work with normal tools like screwdrivers or similar not appropriate tools on a regulator will lead to destruction of your regulator. 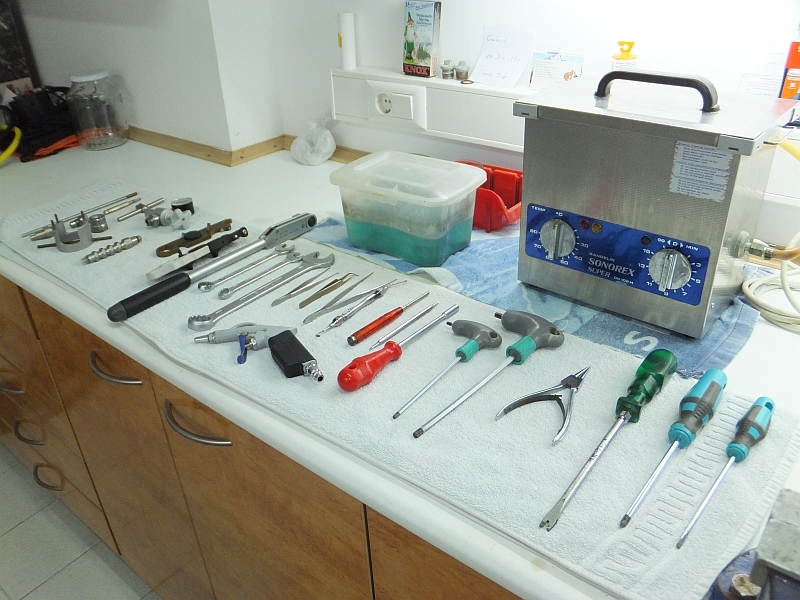 A repair afterwards will be much more expensive as a normal professional service (if possible at all). In case of an accident, no insurance company will pay, if they find out that the regulator has been manipulated by an unprofessional person. Also you will loose any warrenty on regulator. We do explain this here very clearly, as we have been confronted with a lot of really bad regulators. REMEMBER ! YOUR SURVIVAL depends on your equipment. 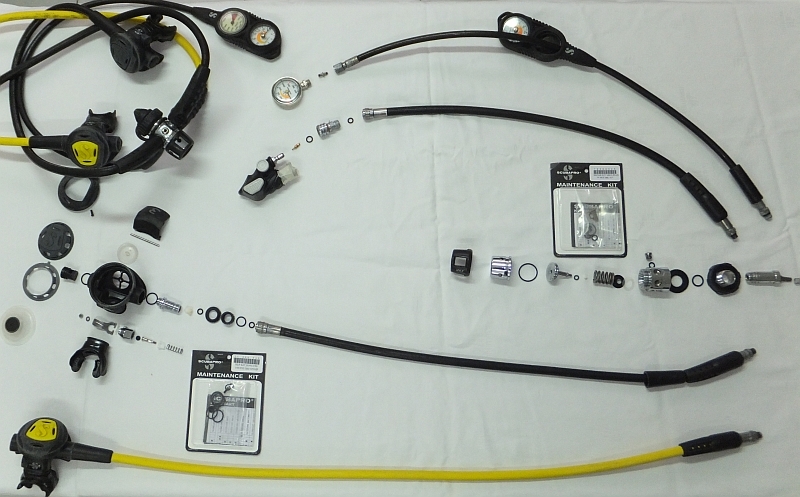 For interested divers we also offer technical courses in equipment maintanence and service. The price for the service depends on type of regulator and expenditure. Usually about 1 to 2 hours of work are necessary. We will charge 30 € per hour. A complete service for a Scubapro MK2Plus with R295 and R295 Octopus lasts 2 hours, the Rep-Kits for MK2 is 15 € and the R295 is 12 € each. In Spain cylinders must have hydrostatic pressure test every 3 years. It is recommended to have a visual inspection once a year as well as a service of the tank valve.